photos courtesy of Jeff Sr.
Winter has begun, the resorts are open and people are rekindling their wintertime friendships. As an employee of Brighton Ski Resort, I look forward to the first day of work. This is the time I get to see who came back for another season of wintertime work. For the past three years that I have worked at Brighton there has been one familiar face that I always see. I had never really talked to him, but we would give the occasional "Hello"? and get on with our business. 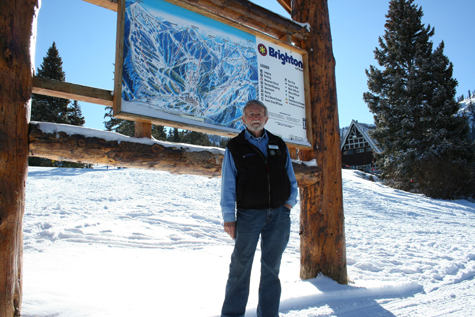 His name is Eric Achter and he has been living the dream at Brighton Ski Resort for 40 years. 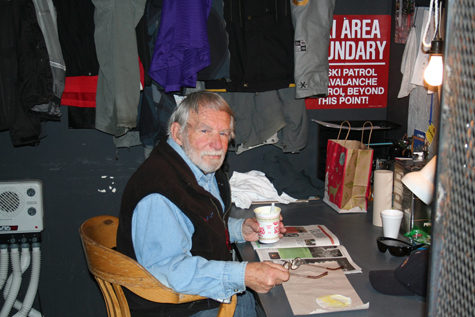 Achter began his role at Brighton as part of the ski patrol. Before Brighton, he was working on Solitude's ski patrol team. Randy Doyle, manager of Brighton Ski Resort, remembers Achter thumbing rides up the canyon over 40 years ago. Doyle believes Achter would still be a patroller if it were not for the slight loss of hearing Achter incurred over time. Once Achter stopped working as a patroller, he worked at the Brighton Store, Alpine Rose and finally found a permanent spot in building maintenance. Achter lives in Farmington and makes the drive to Brighton at least three times a week. With a drive like that, I would personally be over it very quickly, but Achter is always the first one to arrive in the morning. He sometimes even beats the boss, Ricky Morris. I asked Achter what keeps him coming back all these years and his reply was, "What else is there to do in the winter?"? Of course, the paycheck helps, too. The maintenance crew does not have an easy job. They have to clean up after all the guests, including cleaning the restrooms. Fortunately for Achter, Morris leaves him off of bathroom duty. "Eric is the best at washing windows, he knows everybody up here and always has a great attitude,"? Morris says. I asked Achter how it is working with the young crowd and he said, "They keep me moving. They are fun to work with as long as I am not responsible for them!"? During the summers, Achter stays busy taking care of the "honey do"? list, a list put together by his wife. Achter recently sold his motorcycle and now enjoys taking rides on his scooter that packs 250cc of pure power. If you're lucky you may catch Achter out on the slopes, but only if there are no people and the sun is shining.